After a five-year hiatus Rework are back with a new single on Parisian label Meant, featuring remixes from Magda and Remain. Rework, the production outfit of Daniel Varga, Michael Kuebler and Sascha Hedgehog, earned their dance music stripes around the turn of the millennium with a series of strong releases, most notably on Frankfurt-based techno institution Playhouse. Describing their musical aesthetic as "cabaret-independent-house", the act forged a distinct sound that combines icy minimal structures with catchy euro-girl vocals, Anglo-French funk antics and a dash of dancefloor melancholy. Now, Rework return to the fray with a two-sided affair for Paris based Meant Records that shows they have not lost the electric energy that characterised their earlier work. 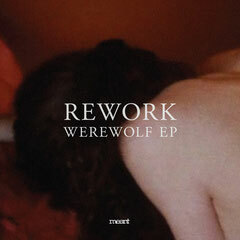 Lead single, ‘Werewolf’, shows that that which made early Rework productions shine, still abounds in their newer material: with ticking drum machines, subtle filter work and no dearth of low-end éclat, it is clear that the Rework sound is still in full vigor. But, far from being a simple rehash, the track ventures into unexplored sonic territories, with shimmering synthetic high-end, buzzing and overdriven sawtooth bass and mantra-like vocal repetitions. B-side, ‘Touch Yourself’, also hearkens back to the Rework sound of old, while moving in exciting new directions. Shuffling hi-hats jitter along, acid-tinged bass gurgles and spits while aqueous digital washes moil in the sonic periphery, producing an atmospheric narcosis that looms over the track like an over-dense cloud. Meanwhile, female vocal imperatives to perform the titular act inject a dose of playful hedonism. Items & Things's Magda takes on remix duties of ‘Werewolf’, and much like a feat of lycanthropy transforms the gentlemanly pulse of the original into an off-kilter stomp. With a soundscape populated by dissonant synth bursts, fluttering toms and reverb-laden hats and snares, the track reveals its tension and dynamism in its subtleties, and indeed the whole thing seems a knob-flick away from breaking into all-out chaos. Providing a Late Night remix of ‘Touch Yourself’ is Meant label head Remain, who adapts the original's atmospherics to a slinky evening cocktail template.